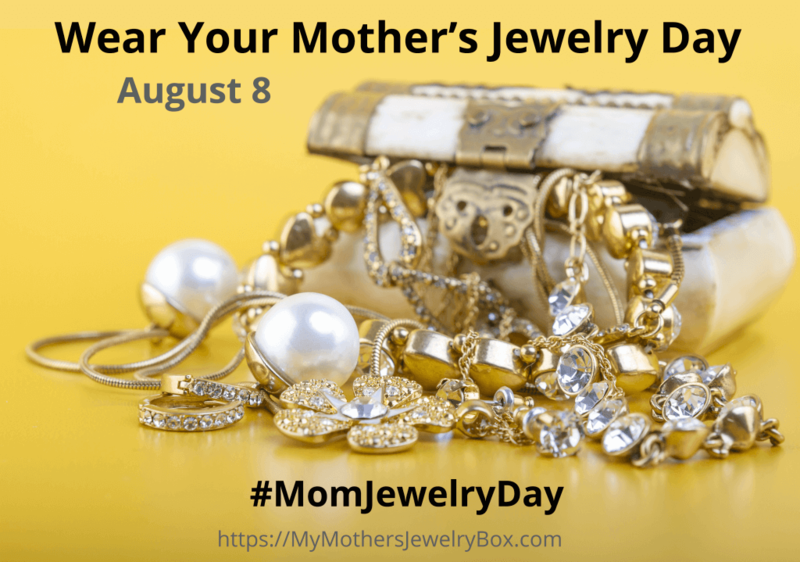 To encourage everyone to dust off forgotten jewelry heirlooms hiding in jewelry and safety deposit boxes, I’ve created “Wear Your Mother’s Jewelry Day” to be celebrated annually on August 8 (my mom’s birthday). 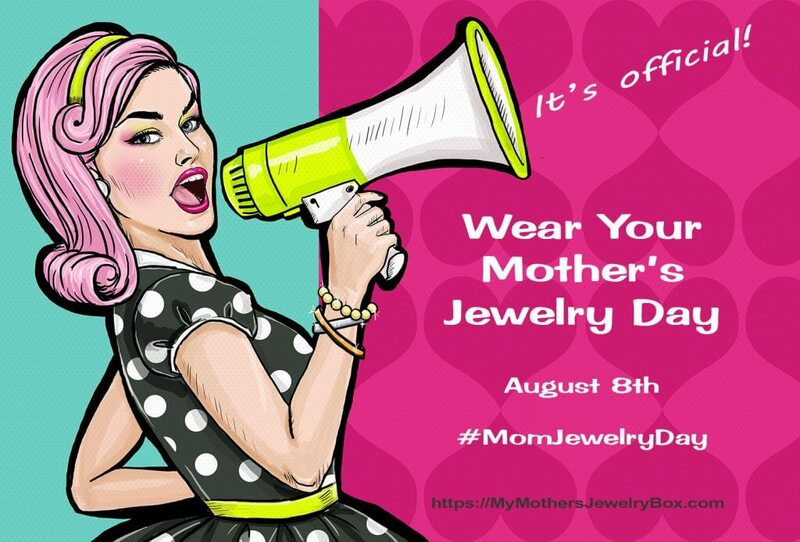 Join the celebration by wearing your inherited jewelry, and by sharing your jewelry stories and pictures via social media using the hashtag #MomJewelryDay or #WearYourMothersJewelryDay. You can also share them with My Mother’s Jewelry Box readers by submitting your jewelry stories here. August 8th is Wear Your Mothers Jewelry Day. 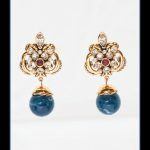 After my mother was diagnosed with dementia, I began blogging about her jewelry (right here at My Mother’s Jewelry Box). When she passed on February 25, 2017, her jewelry box took on new meaning, and I began repairing, resizing, and redeploying some of my favorite pieces. Many of these items were given to Mom with love. Others she chose because she loved them. By wearing them, I’m continuing that chain of love. I had a complicated relationship with my mom, but her jewelry symbolizes the good parts of our relationship; the jewelry pieces I remember from my childhood keep my mom with me in a positive way. I’ve made everyday Wear Your Mother’s Jewelry Day! Don’t know what to do with inherited your jewelry? Repair, resize, redesign, or pass it on! You do not need anyone’s permission. The jewelry was a gift to YOU! You’re in charge now. I know some are reluctant to modify their mom’s, aunt’s, or grandmother’s baubles. 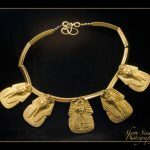 But I believe there is nothing sacrilegious about modernizing inherited jewelry. The redesigned jewelry will still remind you of your loved one, but the new design will be taken out of the jewelry box more often than the original was. Love this idea? Please share on social media using the hashtag #MomJewelryDay. P.S. It’s official! Wear Your Mother’s Jewelry Day has been accepted into the 2018 edition of Chase’s Calendar of Events. I love this! My mom passed away two years ago and my sister last year. Happily I received a few of their jewelry pieces some costume some fine jewelry. I have been wearing their jewelry every chance I get. As a child I remember going through her jewelry box and looking a pieces she loved but never ever wore. Now I wear them and enjoy having them. Thank you for the idea and the few minutes to share. I also have great memories of going through Mom’s jewelry box as a child. Interesting though, the pieces I loved as a child are no longer my favorites! Thanks for sharing your memories. I’ve been on a repairing and resizing binge lately. Hope this encourages you to go ahead and DO IT! I love this idea so much. I think this will resonate with so many women who have great memories and stories of specific pieces of their mother’s jewelry. And it’s such a beautiful way to keep a family history alive. Thank you for your encouraging words, Lois. I appreciate them! I have some pieces of my mom’s, although fine jewelry wasn’t her thing. I love wearing it! I feel so much closer to her. Yes, I absolutely feel closer to Mom when I wear her jewelry. I wish the jewelry could talk, though! I’d love to know more about these pieces, especially the oldest ones. My mother already gave me her fine jewelry. She rarely goes out and thought she’d rather have me wear it now. I do have several pieces from my husband’s grandmother. She died at 100 y/o and her taste was refined and some were very modern. I wear her silver ring every day and get many compliments. What a wonderful idea as a tribute to your mom. BTW I don’t remember know that your mom passed away so recently. Please accept my sincerest condolences, Barbara. May her memory be a blessing. I also have jewelry from my grandmother (I just resized one of her rings for me) and one piece from my great-grandmother. 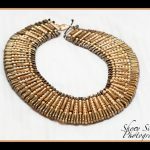 That’s a long “chain” (LOL) of jewelry-loving women! This is ironic…I’ve been going through my mother’s jewelry today, sending photos to my kids trying to decide who gets what!